"Captain's log, stardate 3468.1. While approaching Pollux IV, a planet in the Beta Geminorum system, the Enterprise has been stopped in space by an unknown force of some kind." What if 5,000 years had passed since a band of alien star travelers had visited the Earth and, finding a primitive people scratching away on the rocky hillsides of Greece, set themselves up as gods, thereby laying the foundation of Western culture as we know it? And, what if those "gods" left the Earth as mankind matured and went off deep into space from where they had come? And, further what would happen if men in a starship mapping those distant regions of the galaxy came across one of those figures? Who Mourns for Adonais? attempts to answer those questions and, if one does not look too closely at the story, does so in way that is imminently thought-provoking and dramatically very satisfying. The Enterprise is stopped in space by a giant hand that turns out to be the hand of a being that claims to be the very god Apollo from ancient Earth history. He greets the crew as "my children" but makes the demand that they must stay on his planet and worship him. This is the weakness of the story as Apollo does not seems very enlightened for such an advanced and powerful being, especially after living for 5,000 plus years. Fortunately, the fine performance by Michael Forest as Apollo helps to gloss over some of the questionable aspects of the premise. Kirk, McCoy, Scotty Chekhov and an archaeologist/anthropologist who has been working on the mapping survey, Lt. Carolyn Palamas (Leslie Parrish) form the landing party that beams down to the planet to meet Apollo. Mr. Spock is not invited because Apollo says that the Vulcan reminds him of Pan! According to Star Trek lore, Chekhov was added to the crew of the Enterprise for two reasons: the story is told that word had reached Gene Roddenbery that some were surprised that no member of the crew was Russian, considering the significant successes that the Soviet Union was having in the space race of the 60s. Chekhov was created and was made into a brash and nationalistic Russian with an occasionally odd accent. In addition, it was decided that he would be youthful to appeal to young viewers, and in this episode, he sports his very Beatlish moptop. Once they are on the planet Apollo lays out his plans for an idyllic life of gathering laurel leaves, singing songs and drinking sacramental wine. When he lays eyes on the beautiful lieutenant, he decides to stay in character by taking her as his woman. Apollo replaces Carolyn's Starfleet uniform with a diaphanous gown that the show's costumers have said was literally glued to her body, in keeping with Star Trek's tradition of pushing the censor envelope for the 60s. Kirk must figure out a way to thwart this powerful being and save the crew from either being destroyed or enslaved. The story is ultimately very interesting and very enjoyable. Spock: How do Vulcans choose their mates? Haven't you wondered? Kirk: I guess the rest of us assume that it's done... quite logically. Amok Time is one of the most treasured of Star Trek episodes. The character of Spock, half-human and half-Vulcan, became a phenomenon of popularity that was unexpected by the creators of the show. In fact, the network was very leery of an alien being a lead role in the series. The inner battle of emotion and logic that Spock fought in show after show resonated with viewers and in Amok Time, this is taken to a new level. We find that Spock is behaving very strangely, with abrupt mood changes and a quick temper. McCoy and Kirk investigate and find out that Vulcans have a peculiarity in their reproductive biology that forces them to return to Vulcan "to mate." Although the Enterprise is on an important diplomatic mission, Kirk goes against Starfleet orders to take Spock home, because McCoy determines that if Spock does not return home quickly, he will die. The marriage custom on Vulcan is that children are "united" in a ceremony at age seven and after some years they are driven to consummate the relationship. Spock is engaged to T'Pring (Arlene Martel) and tradition decrees that they meet for the ceremony of Koon-ut-kal-if-fee, or "marriage or challenge." Kirk and McCoy accompany Spock at his request, as his closest friends. It would not be fair to say more about what goes on in this episode. It has all the elements that make Star Trek great viewing and I would not want to spoil it for anyone who has never seen it. The episode was written by respected writer Theodore Sturgeon and sets a standard for quality science fiction. 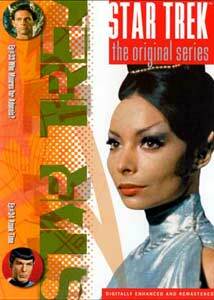 The glimpses of Vulcan are compelling and the plot is intricate and exciting. Amok Time is well worth it for any fan of the genre. Image Transfer Review: Each time I look at one of these re-mastered Star Trek episodes, I just marvel at the quality that Paramount has achieved in the transfer. Frankly, I could just look at those bridge shots all day. Both of these episodes, Apollo's elysian fields and Spock's planet Vulcan are just lovely to look at. Audio Transfer Review: Both of these episodes benefit greatly from the Dolby Digital 5.1 re-mastered sound. The thunder of Apollo's anger in Who Mourns for Adonais?" is fantastic surround work and the eerie atmosphere of Vulcan is enhanced greatly by the subtle shifting of the ceremonial noisemakers during the Koon-ut-kal-if-fee. Really a fine job of taking monural television sound and making it worthy of the home theater. Extras Review: As per usual in this series, no extras other than the original "Next Voyage" teaser for each episode. This is an essential disc for fans of Mr. Spock. Much of the foundation for the Vulcan culture as it has come to be realized in the Star Trek universe was invented for this episode, including the Vulcan salute. With the addition of the Apollo episode, this disc is a good purchase for any science fiction fan. Both shows carry the two sides of the Star Trek coin: the serious speculative fiction and the whimsical fantasy that are the stock in trade for the series.